My wife loves mandevilla (Mandevilla spp.). The deep green foliage and showy flowers of these tropical or subtropical vines provide a nice trellised accent on our front porch. So, when she told me one of our vines was under attack by hordes of sap-sucking aphids, I acted quickly … in the interest of domestic bliss. As with any pest management effort, it's important to identify the pest. 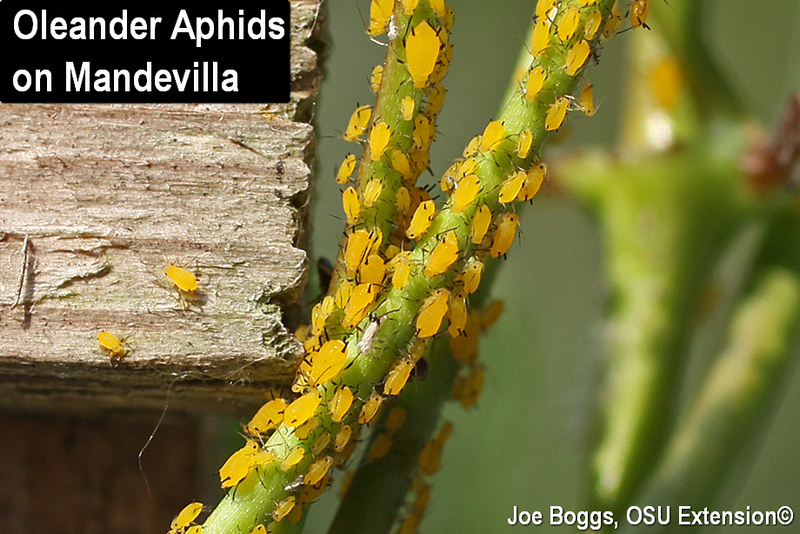 I was surprised to discover the aphids adorning the mandevilla stems were Oleander Aphids (Aphis nerii). These bright yellow aphids are easy to identify with legs that look like they were dipped in black ink and black cornicles (siphuncules) which are the two "stovepipes" on the top of the back end of their abdomens. Readers who grow common milkweed (Asclepias syriaca) for monarchs (Danaus plexippus) and other colorful native insects are no doubt familiar with this non-native aphid. Indeed, it's sometimes called the "milkweed aphid" for its preference for various members of the dogbane family (Apocynaceae); most notably plants in the genera Asclepias (milkweeds); Cynanchum (climbing milkweed, C. laeve), Vinca, and Nerium (oleander). Of course, aficionados of plant taxonomy may be surprised that I was surprised to find oleander aphids on mandevilla. That's because I didn't know these vining plants also belong to the dogbane family; until the aphids taught me. This is not the first time oleander aphids provided me with a plant ID and taxonomy lesson. I never knew there was such a thing as climbing milkweed until I stumbled across a vine in an Ohio woodlot festooned with these aphids. Plant pests can be very helpful with making a plant ID. Oleander aphids are parthenogenetic meaning there are no males; all are females. This partially explains why this aphid can rapidly develop high population densities. They also seem to be resistant to high summer temperatures which is unlike many other aphid species that are most prolific during the cool temperatures of spring and fall. As their common name implies, oleander aphids evolved with their namesake Mediterranean host and draw chemical protection from their host plants. The milky, sticky sap of oleander and milkweeds contains serious toxins called cardenolide glycosides. As with a number of other insects that feed on plants in the dogbane family, oleander aphids incorporate the glycosides into their flesh as protection against predators. It's speculated that their bright yellow coloration warns predators against taking a taste. On the other hand, some insects are unaffected by the aphid's chemical shield. Although research has shown the aphid's honeydew contains cardiac glycosides, the chemicals do not dissuade some ants from "tending" the aphids in exchange for a sweet treat. There are also several predators that are not dissuaded by the aphid's toxic flesh including syrphid (hover) fly larvae, lacewings, and even some lady beetle larvae and adults. Of course, some predators may be cowed by the ants. It's important to preserve the aphid's enemies. So, I blasted the mandevilla stems with a solid stream of water to send the aphids on a wild water ride while declaring, "I am Zeus!" I believe this impressed the Mediterranean aphids but may have surprised the neighbors. Unfortunately, forcefully dislodging the aphids with water may only provide a temporary reprieve depending on the overall aphid trajectory. In case water-logged aphids return, I'm holding in reserve other management options that are also "gentle" on aphid predators and parasitoids. This includes using an insecticidal soap; purchased, not home-mixed. Remember that soaps and detergents produced as cleaning agents may also contain chemicals that are harmful to plants. Manufactures have no need to exclude these compounds because they are not producing products labeled for use on plants. Knocking the leaves off my wife's mandevilla using a "do it yourself" soap mix would not be beneficial to domestic bliss.